On time, prompt service! I am very happy. Dennis was punctual, quick and performed high quality work! Your people have now been here 2 times and the problem persist. The last visit blamed the problem on the electric company, and they now assure us that the problem is with the appliance. Never has such bad experience! Our technician Andrew (ANDY) was absolutely wonderful!! He was extremely knowledgeable about our dishwasher and resolved our issue quickly & efficiently!! 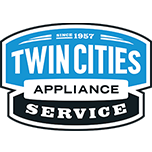 This was our fist experience with Twin Cities Appliance Service and we would DEFINITELY use them again as well as highly recommend them to anyone in need of appliance repair! Not only do they have exceptional customer service, the communication between the company & client is excellent! Thank-you for a job well done!!!!!!!!!!! Great service - really knew his stuff! Dennis went the extra mile as he just did not solve the problem but taped some wires that could cause a problem in the future so he prevented a possible service call. He also saved us some future monies as he mentioned we had two filters - did not need one in refrigerator as reverse osmosis in basement! Hung came in on time and tried to fix my microwave. Replaced 3 door switches and he could’t get it to power up. Without knowing what was the reason for not power up he said “this will cost more by the hour to trouble shoot”. I said “let’s not do it now”. He gave me a bill for approx $100. Paid it and junk out the 2 year old Whirlpool microwave. The fix did not resolve the original issue! Hung replaced door switches but the power was out. Mother board??? Hung was very efficient and timely. However he wasn't willing to engage much with us to answer our questions and to put us at ease. His answers were very blunt. I only mentioned this for his improvement and for building better relations with your clientele. Andy was very nice. I have no idea what he did other than replacing a board. Hope it works. Service on schedule, very friendly tech, diagnosed problem and solved it. Good Work! I was lucky to get Lukas as my repairman. He was very knowledgeable, quick and helpful with the repair of my Whirlpool microwave. I had a misunderstanding with the Whirlpool customer service line and he stepped up and helped me save some cash. Thank you, thank you Lukas! You are a real professional! DRYER WHIRLPOOL WED92HEFW2 "Installed new valve, found leaks, ran unit, all functions ok"
MICRO/OVEN WHIRLPOOL WOC75EC0HS01 "Unit was in demo mode. Wouldn’t go into test mode and reset wouldn’t fix either. Called techline. To get out of demo mode need to press try product, then explore, press tools key, scroll down to info, then shut off demo mode. All checks ok after getting out of demo." REFRIGERATOR WHIRLPOOL WRF535SWHZ00 Installed new reservoir. Operation tested good. WASHER MAYTAG LSE7806ACE Install lid switch kit tested out good..
REFRIGERATOR KENMORE 106.589637 The refrigerator is tripping the gfi above the bar when the compressor starts. I plugged it into a different circuit and it is only drawing 1.3 amps. Customer needs to have the gfi replaced. REFRIGERATOR WHIRLPOOL WRF757SDEM00 Installed new control board kit and power supply board. Operation tested good. MICRO/OVEN WHIRLPOOL WOC97EC0HZ00 "Found communication error codes, panel already replaced, need to try communication harness, customer said last tech scratched lower door panel, took pics talked to TK , harness backorded office to follow up with customer ; ordrng 1 W11135901 (glass-door) and 1 W11233529 (harns-wire)"
MICROWAVE KITCHENAID KHMS2056SSS2 "Light/fan switch assy non responsive at times, need to replaced switch assy, might be able to take cover off without taking down but ordering second man just Incase, fan sounds okay today, fan likely overheating due to low air flow because vent filters plugged 100% inst cust must clean these; ordrng 1 SECONDMAN, rqstng P&A on 1 WPW10403041 (cntrl-elec)"
DISHWASHER WHIRLPOOL WDT750SAHZ0 "Installed part, ran diagnostics through ok, no leaks, all functions ok"
REFRIGERATOR WHIRLPOOL WRF757SDHZ00 "Installed new doors, insulated around the cap tube and adjusted the drier. No popping noises today." REFRIGERATOR KITCHEN AID KSCS25INSS01 Installed new control kit and confirmed both fans are now running. Customer will leave it off for 24 hours to let the evaporator defrost. DISHWASHER WHIRLPOOL WDT920SADM1 "F7e1, Found in diagnostics, ran diagnostics through no motor movement, heating ok, unit needs new sump, home owner not available at moment, customer to call into whirlpool to see if they will cover repair costs, unit owes 97.95 for trip; ordrng 1 DONOTORDERPARTS and 1 ESTIMATEONLY and 1 WPW10671942 (pump&motor)"
OVEN WHIRLPOOL KODE500ESS2 "Heated both ovens to 450, Found noises customer concerned about are normal metal expanding creaks and groans during heating and cooling process, especially when preheating, also customer had put pans on bottom of oven to catch grease, inst cust not to do this as it can cause liner damage, unit operating as designed"
DISHWASHER WHIRLPOOL WDT730PAHB0 Install sump checked over unit tested out good no leaks ran diagnostics went thr fine..
WASHER WHIRLPOOL WTW4855HW1 "Found noises to be normal customer had video, noise is just motor agitating, this is normal and may be louder with the more clothes in unit, ran diagnostics through ok' no leaks"
MICRO/OVEN WHIRLPOOL WOC97EC0HZ00 "Per customer it shuts off and clock jumps around, one time didn’t finish a pizza, so ordering control to return..; ordrng 1 W11299279 (CONTROL)"
REFRIGERATOR WHIRLPOOL WRS325FDAM04 Customer stated ice maker not making ice. The bucket was full with ice she had bought and cubes the refrigerator made. I dumped some of the cubes and the ice maker started to cycle. The bar might have been in the off position at one point. MICROWAVE WHIRLPOOL WMH53521HZ3 Install microwave door assembly unit looks good customer satisfied with look..